My two sons are both in major growth spurts. It was inevitable that I would have two kids that ate a ton. I remember my mother complaining when I came home every day after school and raided the fridge before dinner. Granted I would still eat my whole dinner, but I also normally ate half of the ingredients for the rest of the weeks meals. I was lucky that I was very active and took after my dad who is 6'3 and very thin. My two boys are exact replicas of me with food. They snack the entire day, and I do mean the entire day. If being a grazer was an Olympic sport my sons and I would take all three medals. It is one of the things that has always annoyed my husband. When we were dating I would order the worst for me thing on the menu, follow it up with dessert and still only weigh 115 pounds when I got pregnant with my first son. Now time has taken a slight toll, but my metabolism is still very high (with help from my tread-mill which I use while watching TV). Since my kids and I eat so frequently I am always cooking or baking snacks. I try to make my snacks as healthy as possible, but I also do allow in the occasional treat. Now that I eat gluten free I have been trying out a large number of new baking recipes. 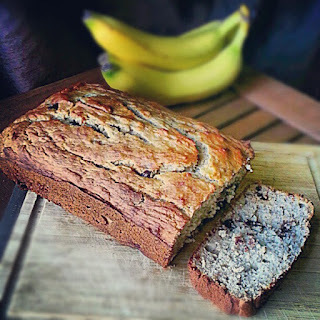 A couple of months back I tried a new recipe for Gluten Free Chocolate Chip Banana Bread, which looked like the perfect recipe to use the blackened bananas sitting on my counter. This recipe has 10 ingredients. It takes 1 hour 15 minutes of total time, 15 minutes of which is active and makes one loaf (approximately 16 servings). At the time that I made this recipe I had never seen coconut sugar at my local store, so I used regular granulated sugar. I am happy to report that since that time I have seen and purchased coconut sugar and have used it in many baking recipes and it works great. Since my two boys and I are not fans of walnuts in baked goods I left them out of this recipe. I did add chocolate chips. The recipe only uses 1/3 of a cup of dark chocolate chips, but that was just too little for my chocolate addiction so I used 3/4 of a cup. My total baking time was slightly longer than the hour suggested and I tented my bread the last 30 minutes of baking to prevent burning. I followed the remainder of the recipe as written. My two boys absolutely loved this recipe. Often times gluten free recipes can be too crumbly or taste nothing like their gluten counterparts. However, this recipe was perfect and came out very similar to regular banana bread. It stayed moist and was perfect with a cup of tea for an afternoon snack. For the recipe go to Gluten Free Chocolate Chip Banana Bread. I love banana bread! YUM! This looks amazing. My hubby is gluten-free so I have to try this out. Thanks for posting.